Where everything seems possible and nothing is what it seems….enter the labyrinth! 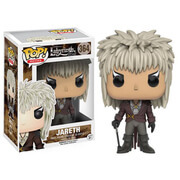 From the 1986 film Labyrinth comes Ludo as a stylized Pop! Vinyl Figure. This Labyrinth Ludo Pop! Vinyl Figure measures approximately 6-inches tall and comes packaged in a window display box. Ludo is my favourite Labyrinth character (apart from the god Jareth). He was my first funko, couldnt have recieved a better funko, i was so happy. If you love labyrinth i don't know why you don't have this pop, great detail and size, also looks amazing along side the other pops in the set.